UK’s company QS Quacquarelli Symonds reveals their the 8th annual QS World University Rankings (2011 – 2012). This year the No. 1 university is University of Cambridge, No.2 university is Harvard University United States and the No. 3 is Massachusetts Institute of Technology (MIT). We don’t know whether there is another similar company can give the similar top 3 names but we know if a company comes from US but not UK, they should have a different ranking list whatever. The following is Rank 20~50 World Universities:. We can see Canada’s McGill University is No. 17 and University of Toronto is No. 23; There are 5 Universities of China are in Top 50 but 3 of them are in Hongkong, other 2 are Beijing University (Peking University) and Tsinghua University which located at No. 46 and No. 47, Beijing University and Tsinghua University are the Top 2 Universities in China mainland, but we can see both of them are behind Hongkong’s Universities. 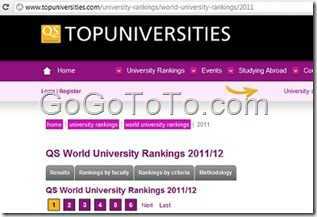 More ranking information please read QS University Ranking.